Kick your Amish Friendship Bread up a notch with this sweet and simple recipe for Blueberry Mango Amish Friendship Bread. 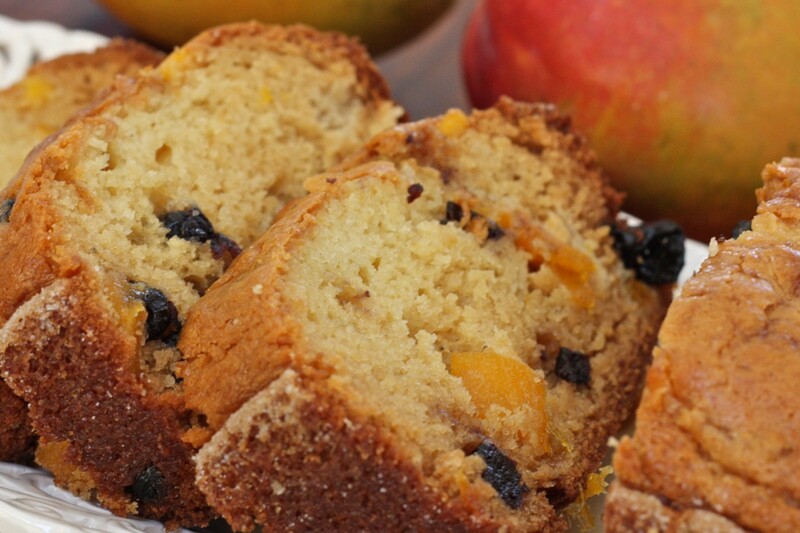 We love this moist, flavorful recipe–the blueberries and mango pair perfectly, and plump up nicely during baking. Let bread cool before slicing. It sure does! The novel includes the recipe for the starter, instructions for the bread, and about 10 other Amish Friendship Bread variations/recipes. One reader shared this idea with us: they read the novel, then signed and dated it in the front, along with a note about what they enjoyed most about the book. Then they passed it onto their friends, who are doing the same, and they plan to continue doing that until all the front and back pages are filled up. That might be a fun idea to share with the women in your life. Would love to see a picture if the novel ever makes its way back to you! Thank you for being a friend of the Kitchen, Pamela! I would love to make this..mangos are our family favorite but we don’t get to eat it often!